The last mile to my house is gravel. Its name, a longish number and the appellation Boulevard, seems incongruous. I think of it as Sparrow Road, for the changing cast of birds who chorus from the fences at field edge. 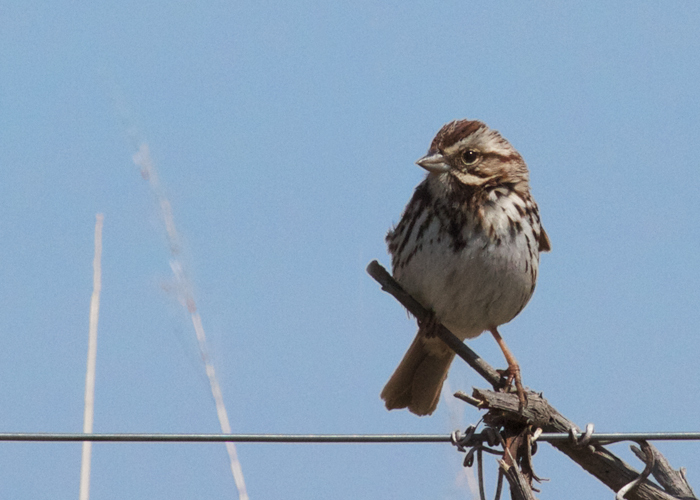 Like this song sparrow who cautiously paused his singing to watch me pass this morning. Want to treat yourself well? Ahh, the new Swarovski CL Pocket binocular! Sublime optical quality and hand-friendly design in a pocket-sized binocular! The new pocket Swarovski is so compact and lightweight that you'll always want to take it with you. Birding, sightseeing, traveling, the theater, or just out for a walk.